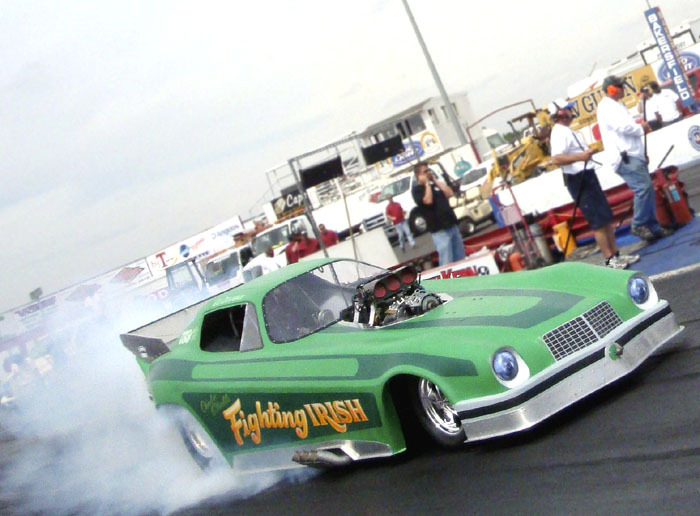 After qualifying #2 at DragFest on Saturday, my team and I made our way through Funny Car Eliminator on Sunday and faced off against the potent Ed Dougan and the Fighting Irish machine in the final round. 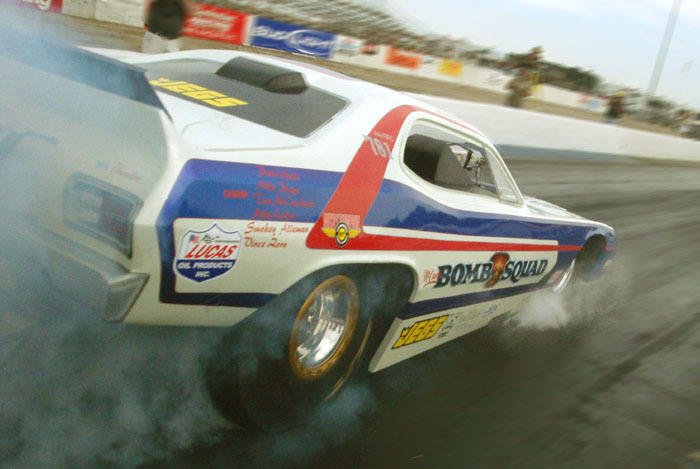 Neither myself nor the guys had ever claimed an event win in a Nitro Funny Car — although I came within a whisker one year ago at the NHRA Heritage Series race in Las Vegas while driving the Future Flash Charger, when, unfortunately, an errant connecting rod punched a hole in the block, oil got under the right slick and… well, we don’t need to revisit the aftermath of all that, do we? 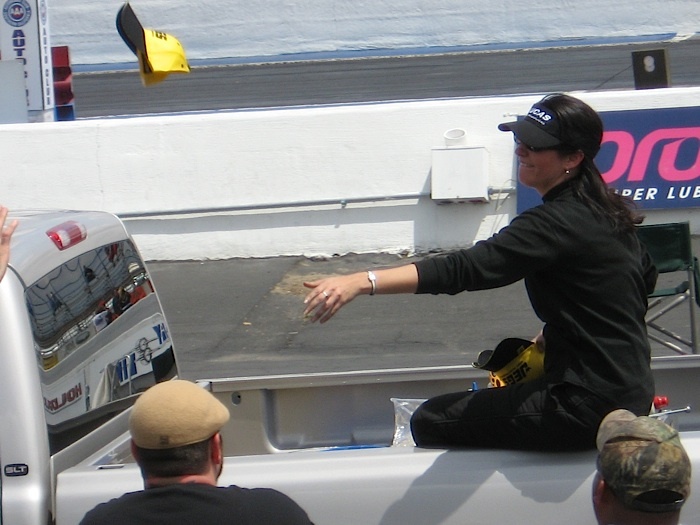 My second appearance in a Nitro Funny Car final round was every bit as exciting as my first, and thankfully, not nearly as catastrophic. I did my burnout first. Unbeknownst to me our competition was in trouble, struggling to even make it into the water box. After an anxious minute and a half of their team frantically trying to disengage the blower starter while I sat waiting with my motor cackling, Irish-pilot Ed Dougan does a brief burnout, and pre-stages. I follow suit, we both stage, the light goes green and I am off the line first. Dougan is hot on my tail and keeps his foot planted on the gas, driving around me by half-track and holding a four-foot lead. At the top end, the Fighting Irish clock a victorious 6.04 to trump our 6.12. It was a tremendous drag race; one that was decided at the finish line by hundredths of second. But no matter how exciting, allow me to say that this bridesmaid business blows! Bummer! Next up: In two weeks, the team returns to Las Vegas Motor Speedway for exhibition passes at “The Strip’s” Second Annual “Speed Spectacular” (its NHRA Heritage Series event). Ciao for now, Cyber-Nitro Kats and Kittens. Thank you for the post and thank you for coming to Sacramento we had a blast. For some strange reason only the bottom of the above post is being shown properly, is it my laptop or the website ?